The patented, molded-in WaveBrake Mopping Trolley inhibits wave formation, which reduces splashing by 40%. Buckets stack, even with the wheels attached, for more efficient storage. Wringer has been tested to exceed 50,000 cycles. 30° handle bend is easier on the user’s wrist and shoulder. Improve productivity with this compact janitor’s cart and mopping combo, all in one. 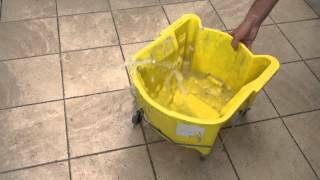 Trolley handle for easy transport and storage of safety sign and lobby dust pan. Removable maid caddy for two spray bottles and cleaning supplies. Accommodates a 13-gallon poly liner for waste collection. Quiet Caster Dolly makes less noise than a traditional mop bucket. System also includes “bucket-in-bucket” design to separate clean and dirty water and an additional accessory bucket for extra cleaning solution or waste collection. Bucket capacity: 35 qt. Wringer capacity: up to 32-oz. mops. Yellow.